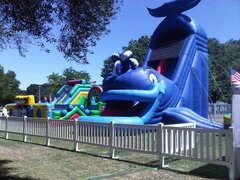 Sacramento Party Jumps will have your guests in awe with our jaw dropping Slide Rentals! Climbing to the top of a slide and racing down the other side is something most of us have enjoyed since we were children. Let us kick it up a notch with one of our over the top inflatable slides. 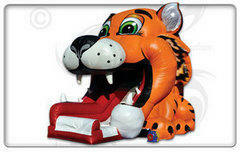 Our Big Mouth Tiger Slide would be a BIG hit at a child birthday party, The fun tiger theme will be loved by children and the slide will give them hours of entertainment. Need a little more intensity? Check out our Giant Slide! This would add that thrill you're looking for a 20 foot drop down to the party. Still not enough? Then our 35ft Whale slide in the one for you! 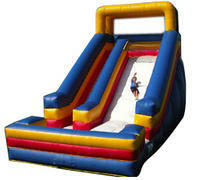 With its near vertical 21 ft drop your guest will definitely get that thrill their looking for. These Slide Rentals are guaranteed to draw big crowds. Planning a large event? Let Sacramento Party Jumps help you with the details! A bounce house rental would be an excellent combination with once of are great slide rentals. Call today and let us make your party a hit. Sacramento Party Jumps is conveniently located in sunny Sacramento, CA! We proudly serve the greater Sacramento Area. We promise our trained professionals with be courteous and deliver on time. Giving our customers a fun experience is our goal! We know delivering a clean and properly working bouncer is part of the experience. You can count on us! Full service delivery. With over 9,000 parties delivered, we know we can help make your event people wont soon forget!